How do you order a Quilted Bedspread? Ordering a quilted bedspread may seem straight forward but there are some aspects that you may need to take into account. Quilted bedspreads have been a staple of the classic bedroom look for decades. It's provides an extra layer of warmth at night while in the day it can add an extra splash of colour to finish off your bedroom. 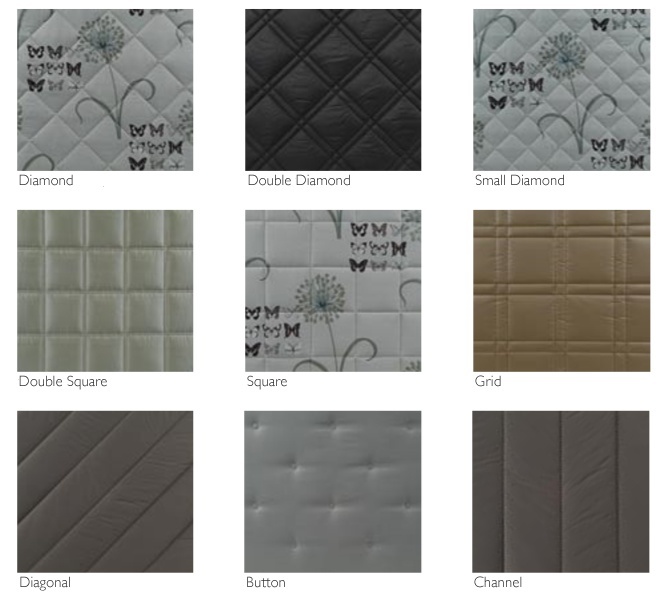 We've expanded our range to include new edging and corner options so we can make the quilted bedspread perfect to you! We've detailed below all the new extras we can offer with our bedspread. While the calssic throw is still catered for, (see our main bed image) we have added new corners and edges so that four poster and iron beds can be accomodated for. So, lets take you through the steps of ordering a new bedspread. We have hundreds of fabrics to choose from so if your preference is modern or traditional we should have a fabric to suit. Take a look at our main suppliers designs: clarke and clarke Fryetts If your not sure, call our friendly customer service staff on 01706 220020, we can guide you through our materials and send you samples of any before you make your choice. After choosing your fabric you can choose how your bedspread will be quilted. At Victoria Linen we have a number of great quilting designs available including standard diamond quilting to more modern channel and double diamond designs. Finally, its time to choose how your corners will finish. If you just want your bedspread as a classic throw then there is no need to make a choice here. But if your bed has a footboard or is similar to a sleigh bed or a four poster bed then this is something you may need to think about. A semi fitted corner is a completely stitched corner to give you bedspread a snug fit. A split corner has no lining fabric and is ideal for a iron bed, the same with a split corner with post as this is a split that is made bigger to accomodate the larger legs. Finally a split corner with footboard finishes the valance at the foot of the bed, this bedspread comes with a fold of fabric to tuck under the mattress and hold it in place. And thats all the decisions made! All you have to do now is wait a short while and we will have your stunning bedspread made up and on its way to you. You'll be snug in no time! Take a look at some of our bedspreads we have available online here. If you need any further information or would like help when choosing your bedspread please leave a comment below or give us a call on 01706 220020. We'll be happy to help.